CLEVELAND — Imagine feeding your dog a food that's slowly taking years of their life. Most pet owners wouldn't think of such a thing, but it's happening all over the country. 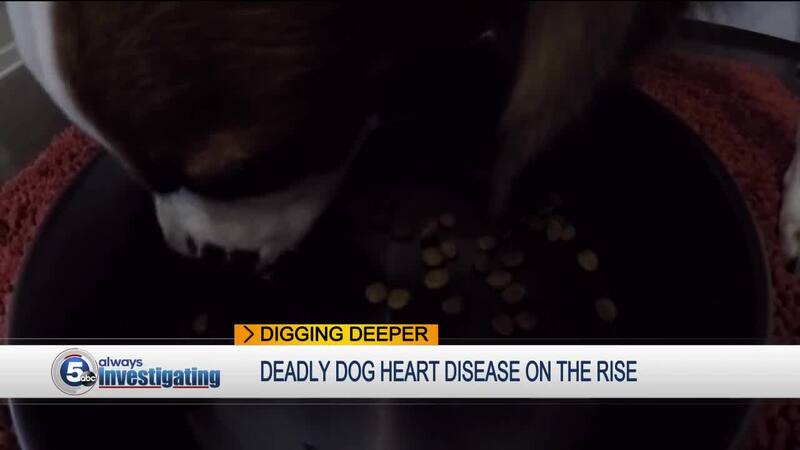 Back in November, WEWS reported on the U.S Food and Drug Administration's investigation into the possible link between certain dog diets and the deadly heart disease called dilated cardiomyopathy, also known as DCM. It’s a disease where the heart becomes enlarged and pumps poorly, thus decreasing the amount of blood throughout the body. Allison Heaney, a veterinarian cardiologist, said the disease can lead to congestive heart failure, and in some cases, much worse. "It can also in some situations result in sudden death,” she said. Since the WEWS report in November, even more dogs have been diagnosed. Thousands of dog owners have shared their stories on a Facebook page in hopes of spreading awareness about the disease. More than 17,000 people follow the social media page, which is monitored by a team of animal professionals. In a peer review, recently released in the Journal of the American Veterinary Medical Association, five veterinarians addressed the history of DCM and what researchers currently know. The article said DCM first came to light in the late 1980s in cats, as it was considered a common cardiac disease. In the peer review, researchers said, "DCM in cats was associated with a taurine deficiency and could be reversed by providing supplemental taurine. On the basis of that report and substantial subsequent research, the requirement for taurine in cat foods was increased, and taurine deficiency–related DCM is now uncommon in cats." However, the same approach that researchers used with cats can't be used in the recent spike of DCM cases. In most cases right now, dogs who are being diagnosed with the disease are not taurine deficient, according to Lisa Freeman, a board-certified veterinary nutritionist from Tufts University. Researchers have been gathering information about the current cases since the FDA's investigation, which was launched last summer. Veterinarians across the country are reporting their cases to the FDA and each dog is being monitored on an individual basis. They believe a large majority of cases are diet associated. The suspicion is that dogs who are on the BEG diet are being diagnosed with the disease at a higher rate. BEG diets include boutique, exotic and grain-free foods. Freeman said some of the dogs improved when their diets were changed. Typically, BEG diets include ingredients like kangaroo, duck, buffalo, salmon, lamb, bison, venison, lentils, peas, fava beans, tapioca, barley or chickpeas as major ingredients. These are ingredients dog owners want to avoid if they're listed in the first five ingredients in a dog food. However, neither researchers nor the FDA have concluded what ingredients in these foods is causing the problem. In the article featured in the AVMA, researchers said, "although there appears to be an association between DCM and feeding BEG, vegetarian, vegan, or home-prepared diets in dogs, a cause-and-effect relationship has not been proven, and other factors may be equally or more important. " If you've been feeding your dog one of the foods in the BEG diet, you may be wondering, "how do I know if my dog has DCM?" It's not that simple because oftentimes symptoms for the deadly disease go undetected for long periods of time. Freeman advises pet owners to look for signs of heart disease: weakness, slowing down, less able to exercise, shortness of breath, coughing or fainting. If you notice any of these signs, call your vet. If your vet feels your dog may be at risk for DCM they may listen for an abnormal heart rhythm, perform blood tests or an echocardiogram (an ultrasound of the heart). WEWS reached out to a local pet store owner about the animal disease. Jennifer Baker, owner of the Grateful Dog Bakery in North Ridgeville, Ohio, said customers have come into her store for the past six months asking questions about the types of food they should be feeding their animal since word of the spike in DCM cases has spread. She said answering their questions isn't exactly easy, considering researchers and those at the FDA still can't narrow down the ingredients at fault. “The research is showing predominantly grain-free foods are the problem, but not all. It’s predominantly golden retrievers, but not all. So there’s no really good answer that you can give people," Baker said. Baker, who's not a veterinarian, researcher nor nutritionist, said she has been staying up-to-date on the latest findings since the FDA warning was issued last summer. Baker said when looking for dog food, don't cut corners and do your homework before buying food. Researchers believe this spike in cases is just the tip of the iceberg. As additional cases are brought to light, new findings are going to be shared among professionals and dog owners alike. "My hope is that the one bright side of this serious situation is that it will shine a light on the complexities of making safe and nutritious pet food and the importance of nutritional expertise and quality control, rather than just what is new and trendy," Freeman said in a blog post.